The famous British puppet Mr Punch could have been made foul tempered as a result of a medical condition, according to new research. University of Derby's David Bryson said the icon famed for beating wife Judy with a stick could have been suffering from acromegaly. The teaching fellow said the puppet, who can be traced back to Roman times, resembles a sufferer of the condition. Symptoms include prominent facial features and large hands. The research suggests the seaside icon - famed for his "That's the way to do it" catchphrase - was a caricature of a sufferer of the condition, which results in too much growth hormone. "We laugh at Mr Punch's antics without thinking about his origin. "Why does he have a large nose and a prominent chin? What is the reason for the hump on his back and large paunch?" Mr Bryson asked. He discovered the character originated in Roman times as either a country bumpkin called Maccus, or comic servant named Bucco, which developed into Pulcinella, a character from the Italian "maschere" or masked characters used in plays. Pulcinella was first introduced in England after the restoration of Charles II, who gave patronage to performances by actors in 1672. A revival in the 1790s led to the preservation of Mr Punch as a glove puppet. 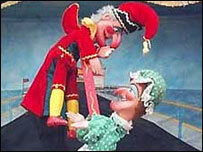 Mr Bryson added: "The history of Mr Punch has been the institutionalisation of a caricature. "Continual reinforcement has entrenched the caricature so that it has taken on a life of its own beyond its origins." Mr Bryson said previous connections had been made between Pulcinella and acromegaly. He also said there could be a link between Punch hitting people on the head and the debilitating headaches acromegalics suffer from.